Own a Motorola Xoom in the UK? Get Your Free Wireless Keyboard & Mouse Now! Well this is some good news for any Motorola Xoom owners out there in hte UK. 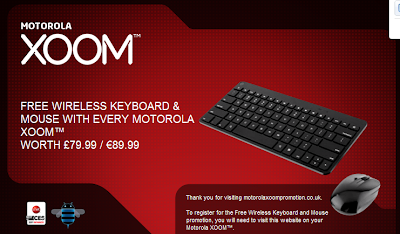 Motorola is offering to send you a free wireless mouse and keyboard worth Â£79.99! All you have to do is visit THIS PAGE on your Xoom tablet. You need to be over 16, live in the UK, and be the originla purchaser of the Xoom, oh and there is a limited stock so I would get there asap if I were you! 1. This Promotion is open from 1 July 2011 to individuals (â€œCustomersâ€) aged 16 years or over, who are resident in the United Kingdom and Ireland and who are the original purchaser of any brand new Motorola XOOM device purchased from a reputable retailer in the United Kingdom from 1st July 2011 to 31st August inclusive*, excluding employees of Motorola and its affiliates, contractors, agents and their families, and anyone else directly or indirectly connected with this Promotion. *A very limited extra number of Promotional packs of a Wireless Keyboard and Mouse will be available on a strictly first come, first served basis to Customers who purchased a Motorola XOOM prior to 1 July 2011. 2. Registrations by agents or any party acting on behalf of the Customer will not be accepted. Customers are deemed to have accepted these terms and conditions and agree to be bound by them when taking advantage of this Promotion. 3. Only one entry per Customer is permitted. Cannot be used in conjunction with any other promotion or offer. 4. To be eligible to for the Promotion, Customers must submit the original Proof of Purchase of their Motorola XOOM by registering atÂ www.motorolaxoompromotion.co.ukusing their Motorola XOOM. . For the avoidance of doubt, only original proofs of purchase by the original purchaser are acceptable and any purchases of previously owned devices through any auction or resale channel are not eligible for participation in this Promotion. 5. Customers will receive a verification email fromsupport@motorolaxoompromotion.co.uk. Customers will receive a Wireless Keyboard and Mouse (RRP Â£74.99 / â‚¬89.99), shipped to the address supplied on registration. Goods are as stated and are non-transferable. No cash alternatives will be offered. 6. All costs associated with hardware and software required to successfully complete registration for this Promotion is entirely the responsibility of the Customer. 7. The Promotion is open while stocks of the Wireless Keyboard and Mouse last. Motorola reserves the right to cancel, amend, terminate or temporarily suspend the Promotion in the event of any unforeseen circumstances or technical reason outside its reasonable control, with no liability to any Customers or third parties. 8. Your information will be collected and stored by 368 Limited on behalf of Motorola for the purposes of administering the Promotion, and will be stored on servers residing in the United Kingdom, and shared with Motorola Mobility, Inc., and its affiliates and subsidiaries, some of which reside outside of United Kingdom. Motorola respects the privacy of its Customers. For further information on Motorola's privacy practices, please visitÂ http://www.motorola.com/Consumers/US-EN/About_Motorola/Legal/Privacy_PolicyÂ Promoter: Motorola Mobility UK Ltd, Chineham Business Park, Basingstoke, RG24 8WQ.